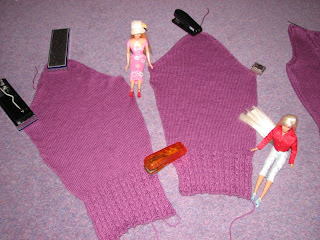 I've got the sleeves finished now, so have started on the ties. I think it won't be long before I can post a picture of the finished article! Ha! I love your Barbie helpers!!! Can't wait to see the sweater! Wow...you have a staff of Sweater Blockers. How nice. How exactly do you write that want ad? "Must be pretty, fashionable and willing to sit in the same position for days on end until yarn dries." And the sleeves are lovely too. Good show.